Those of you who follow WebUpd8 on Twitter or Facebook saw a teaser about this yesterday. Well, after some further testing it seems everything works, so here it is! 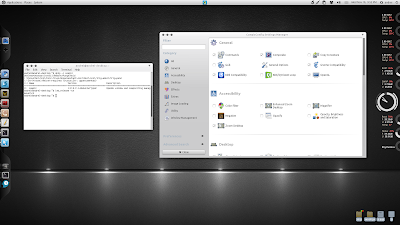 Compiz 0.9.2.1 was uploaded to the official Ubuntu 11.04 Natty Narwhal repositories yesterday and to a PPA. I was hoping we'll also get a PPA with Ubuntu 10.10 packages but only part of the packages have been uploaded to that PPA (and they don't work even if you install the rest of the Compiz dependencies). But I though I'd copy the Natty packages in a PPA for Maverick and give it a try and I was surprised to see... it actually works. However, most part of the plugins are not available yet so using the PPA I've set up (which is a temporarely PPA by the way - until Compiz 0.9.2 (or newer) packages will be uploaded to an official PPA) you'll only get the "main" (compiz-fusion-plugins-main) plugins. Also, Emerald won't work. Before proceeding, I'll have to warn you that using this PPA may break stuff or make your computer explode (not really, but you get the idea). So use it at your own risk! I've set it up for me but I just had to share it since a lot of you might want to test the latest Compiz 0.9.2 which has been completely re-written. Also, this PPA only has packages for Ubuntu 10.10 Maverick Meerkat. Note: I've tested it on Ubuntu 10.10 Maverick Meerkat 32bit only! Before installing the latest Compiz, you may want to backup your Compiz settings. To do this, go to System > Preferences > CompizConfig Settings Manager > Preferences and select "Export", then save the exported file. The "apt-get install -f" command is required because when upgrading from Compiz 0.8.x, a file must from a different Compiz package mst be overwritten. I think I've fixed this by backporting a fix from Natty that came today, but I'm not 100% sure. At this point most stuff should be working except ALT + F2 and the window borders. Go to System > Prefereces > CompizConfig Settings Manager and check the "Window Decorator" plugin as well as "Gnome Compatibility" (important! this is required or else ALT + F2 won't work). Also check out some other plugins you may want to enable. 5. Everything should be working fine now except for a glitch with focusing windows. This should be fixed if you log out and log back in. If not, try a restart. Thanks to Didier Roche for the packages. All I did was copy them in a new PPA and build them for Ubuntu 10.10 Maverick Meerkat instead of Natty.